Expat Vacation: Is Ignorance Bliss? Don’t you just love going on vacation? You clean the fridge, pack your bags and lock the door behind you. You get on a plane — to Amsterdam, let’s say — and you forget about your house. After all, what can go wrong? Have you ever been to Amsterdam? It’s a fabulous town, but then I’m prejudiced since I am Dutch. It’s July and my man and I are enjoying our vacation in my native Holland while far away in Moldova secret things are going on in our empty expat house. Nobody knows, nobody sees. We do what we always do when we’re in Amsterdam – we cruise the streets of the old centrum and reminisce. I used to live here as a child, and I met my American prince here while we both were students. We sit on terraces and drink wonderful strong coffee and watch the people go by. I love Dutch coffee and I love people watching. Although I’m a bit of a food snob, I must confess that on occasion I actually crave Dutch junk food, because, well, it’s part of my cultural heritage and I hope you’ll forgive me. 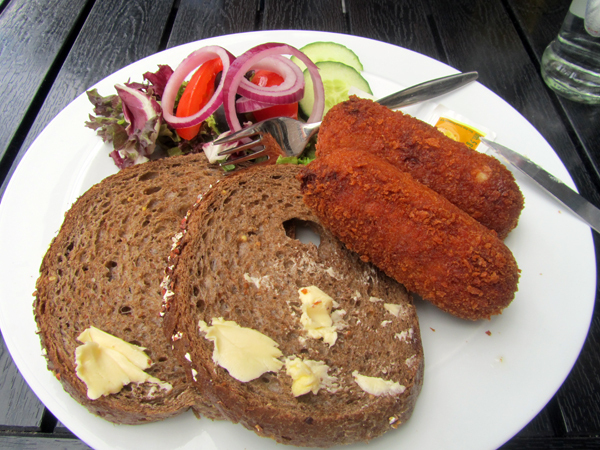 So one afternoon in a small restaurant I order a broodje kroket, which is two slices of bread and two meat croquettes. Please do notice I request whole grain bread, or at least what is called “brown” bread here. Unfortunately I have trouble placing my order because the waiter, a handsome kid with soulful dark eyes, doesn’t speak Dutch. He’s from Portugal, speaks Portuguese, Spanish, English and some French. No Dutch. I’m a bit miffed. I mean, I cannot speak my own language in my own country ordering my own national junk food? Sheesh! But the sun shines (now) and I decide not to let it ruin my day. We enjoy wandering around in the narrow streets with their fun shops, art studios, and interesting galleries. And yes, the “coffee” shops, where in front cannabis smokers are sitting blissfully in the sunshine. I don’t notice them at first, until the daughters, who have arrived from America to join us, point one out as we pass it. “Don’t you smell it?” Daughter Number Two asks, amazed at my ignorant oblivion. Well, no, I guess not. I take a deep breath. After all, it’s free. We’re happy to be together, the four of us. And it’s just as well that my prince and I are unaware of what’s going on in our house in Moldova. Because nobody knows. Nobody sees. I love the canal houses and I want to live in one of them. A straight one. Some are sagging, but I’d like to see you when you’re 400 hundred years old. These aren’t as crooked as they look on the photo; something to do with where I’m standing and holding the camera. Should I buy one of these places? I think not. For the price of one of these houses you can buy your own private island in the Caribbean and the weather is better there if you want to overlook hurricanes. So what about a houseboat bobbing on a canal? Romantic you say? Sadly I’m not that romantic. The coziness of physical closeness is overrated. I like my space. No houseboat for me. A few years ago, I sat on the terrace of this very restaurant with Daughter Number Two. Maybe even on the same chairs you see outside the window. I noticed her scanning the many bicycles parked along the canal with a look of disdain. “What a bunch of crap,” she announced. Well, yes. These are transport vehicles, not high-tech mountain bikes. And if you have a trendy sport bike, it might get stolen. Bike-stealing is a national pastime here. So I felt it was my duty to enlighten her about this situation, since this is part of her heritage and she should not make harsh judgments about Dutch bikes. Fancy or not, they’re green transportation and people love them. Some even decorate them. Probably give them names. Although now and then during our time here I indulge in Dutch junk food to keep in touch with my roots, we mostly eat wonderful food. One night in the center of Amsterdam we dine royally in an upscale restaurant where all the other diners speak Dutch. Imagine that! Not a foreign tongue among them! One street over, the many eateries are filled with tourists consuming mediocre food. So how did we find this place? What can I tell you, I have connections. Such as an Amsterdam cousin, who is a chef. And as we sit there, sipping wine and eating lobster and other deliciousness, secret things are still going on in our expat house in Moldova. Nobody knows, nobody sees. Days later, as we drive out of Amsterdam to venture into the countryside, my mate’s BlackBerry rings. And that’s when we hear what’s secretly been going on in our empty expat house in Moldova. But that’s another story. Have you ever been to Amsterdam? What do you like to do when you go back to your home country? Tell me a story! I love going back home to the UK, I finally can relax and talk to people. I feel like living in a country and not speaking much of the language makes me stressed out, come rain or shine. I am not sure how I would react if I encountered someone in Britain who couldn’t serve me in English, but I think I would feel a lot of empathy for them. Living as an expat in England, I’m experiencing rain of all different strengths and types- does it rain a lot in Moldovia too? I think living in a country with such a strong cycling history would be wonderful with a carefree element to it. Oh, and such a cliffhanger – I love it! We’ve been having a bit of rain here, July-August, in the tropics too. Odd weather, to be honest. Bike stealing has become such a national pastime here that people have slowed down using them. That’s sad because this land is flat, bikes are such an inexpensive, eco-way to travel. Now the city stinks with carbon because everyone’s using cars / trucks / motor-bikes / mini-buses. I’ve heard that in some places in the US, bicycles are becoming a cool way to go, is that true? I’ve never been to Amsterdam but would like to. I crave British junk food sometimes so I know what you mean! DYING to hear what’s happening in Moldova, you tease! I’ve never been to Amsterdam, although I nearly made it–we were supposed to go to a conference there, but things fell through and we never made it 🙁 I was really disappointed. I am living in my home country at the moment, and very much enjoying this summer. Tons of fresh berries, sun but not heat (except today), lots of green and natural beauty. Oregon is a great place in August. You must come visit sometime. I know all about Oregon 😉 My first expat experience was as a foreign exchange student in high school in North Bend. And my dh is from near Portland. My father-in-law lives in McMinnville and we visit when we can. So, who knows, we’ll meet some time! Your Dutch comfort food looks absolutely revolting, but I do love Amsterdam and all the memories your trip back evoked for me. Looking forward to finding out what happened in your “Nobody knows. Nobody sees.” Expat house while you were away. Revolting?? I never thought of its appearance like that 😉 but trust me, they can be yummy depending on how much meat is used in them. They make little round ones like that as well, as snacks to go with drinks. They’re called bitterballen, but why bitter, no idea, because they’re not. They’re made of a stiff ragout of beef or veal rolled in beaten egg and breadcrumbs, and deep fried. You eat them with mustard. Make sure to order them whenever you are back in Holland again! Yes, Thailand has plenty of sun, maybe a bit too much for me (I am very demanding;) I’m not crazy about sweaty, humid tropical climes and lived in them for many years. Thailand is, of course, fabulous in most other ways! I visited years ago. Yikes, Miss Footloose, have been left on tetterhooks re what happened to/at your Moldovan abode while you were away! Amsterdam is one of my most favorite places. I would love to live there some day. I lived in The Hague but prefer Amsterdam. Just walking the streets and allyways and people and canals. Ahh lovely! I lived in the Netherlands for three years (Wassenaar) and I loved it there! I miss it and therefore was most grateful to hear about your visit to Amsterdam. I too went home for a visit this summer, to New Jersey and like you enjoyed the familiarities of my youth. I have a few friends who love visiting Amsterdam, but I have never been. Now that I live in Sweden and everything is so much closer- so much culture and traditions and new sites to explore! I think you sold me on going for a visit soon- it looks beautiful! Wonderful narrative of your trip, I can’t wait for the rest! Amsterdam is a wonderful city, one I’ve been fortunate to visit on several occasions. On my last trip I was able to visit Rembrandt’s Night Watch in the Rijksmuseum all by myself for nearly an hour. The museum was being renovated and much of the collection was gone, but Rembrandt and I had a long undisturbed conversation. I also love the coffee shops and art galleries. Wonderful, if you don’t get killed by cyclists. Yes, you do need to watch out for the cyclists in Holland. The renovations on the Rijksmuseum are finished, but the art works have not yet been hung or placed so it’s still not open apart from the section where the Night Watch hangs. Hope you get a chance to go back again. OK, now I’m worried. What a cliffhanger to leave us with!